Monday morning dawned across the U.S. to see the news dominated, not by talk of a Final Four match-up featuring Cinderella Loyola of Chicago and Sister Jean, but instead with an intense debate blowing up over President Donald Trump’s selection of former UN ambassador John Bolton to succeed H.R. McMaster as national security advisor. The loquacious and quotable Bolton has been a frequent commentator and critic of the Obama administration’s Iran nuclear deal on Fox News and other media outlets and now finds himself in a key policy position to act on those beliefs. Predictably the response from the Iran lobby was swift, vicious and stupefying. Leading the anti-Bolton charge was the National Iranian American Council, once a ley architect of Iranian appeasement and now finding itself virtually alone on an ever-shrinking game of foreign policy “Survivor” as it allies leave the scene to a newly muscular and empowered Trump administration. Trita Parsi, NIAC president, issued a blistering statement condemning Bolton and blaming for everything short of triggering the Apocalypse. 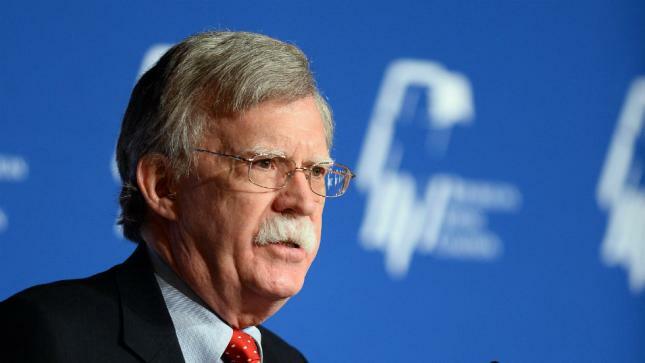 “Bolton is an unhinged advocate for waging World War III. He has explicitly called for bombing Iran for the past ten years and has suggested the U.S. engage in nuclear first strikes in North Korea. Bolton’s first order of business will be to convince Trump to exit the Iran nuclear deal and lay the groundwork for the war he has urged over the past decade. Additionally, he has has called for ending all visas for Iranians, shipping bunker busting weapons to Israel, and supporting the Mujahedin-e Khalq (MEK) terrorist organization and other separatist groups inside of Iran. The Iranian-American community and our pro-peace, pro-human rights allies will organize to stop Bolton’s plans from becoming a reality,” Parsi said. In one paragraph, Parsi has managed to regurgitate virtually every false and misleading key message point the NIAC has articulated over the past five years. Parsi again takes a shot at one of the leading Iranian dissident groups in the MEK, using the “terrorist” label that has already been discredited. It’s also no coincidence Parsi refers to Iranian dissident and democracy groups as “separatist” groups refusing to acknowledge the widespread dissent and protests by ordinary Iranians sweeping across the country. Parsi’s statement goes on to attack Bolton’s support of Iranian dissident groups as emblematic of war mongering, but Parsi doesn’t recognize the vast coalition of humanitarian, political, ethnic, religious and gender groups opposed to the Iranian regime including Amnesty International, members of the Bah’ai faith and virtually all Iranian women. His focus solely on the MEK indicates the Iran lobby’s fears of recognizing the broad and deep resentment of the mullahs, especially the ever-unpopular rule of Hassan Rouhani. Parsi’s hope that somehow slinging the MEK name around might somehow diminish Bolton’s chances for confirmation is a slim one since the MEK and the umbrella group of Iranian dissident and human rights groups it is part of, the National Council of Resistance of Iran, has become an important source of information smuggled out of Iran about protests and the activities of the regime such as the secret development of its nuclear program in the first place. Intelligence services in the EU and the U.S. have commended the quality and veracity of information supplied by these dissident groups, often at great risk to sympathizers in Iran who smuggle out photos and videos, including the most recent Iran protests across the nation. Parsi and the rest of the Iran lobby know the end is here for their policy of appeasing the regime. Pompeo and Bolton are only vocal supporters of ending it. The real architect of getting tougher with Iran is the president himself who used the Iran nuclear deal as a potent message point with American voters on the campaign trail; most of whom were disillusioned in the wake of massive terrorist attacks by Islamic extremists inspired by Iran’s war in Syria. For most Americans, the memories of Orlando, San Bernardino and Paris and Nice mingle with vivid images of handguns, trucks, bombs, knives and virtually any other tool grasped by terrorists to kill innocent people. Parsi is never one for understatement so his statements aimed at Bolton are only natural, but the only unhinged one making crazy statements is Parsi which diminishes his authority and reasonableness in the eyes of many news organizations. That of course hasn’t stopped the NIAC as it made Parsi and fellow staffers Reza Marashi and Jamal Abdi available to news media to talk Bolton. Considering the only news outlets that seem to have picked their comments are Russian and Iranian publications and an occasional Iranian regime advocate blog like Lobelog, we are heartened to see that fewer and fewer journalists frankly care what NIAC has to say. The problem with the histrionics of Parsi and his Iran lobby colleagues is that when you consistently scream at the top of your lungs and sound deranged, no one ends up listening to you. In fact, the much-vaunted echo chamber of the Iran lobby only seems to echo with their own voices and no one else is listening.